With both the Samsung Gear S and Apple Watch now officially announced, I felt it was a good opportunity to review the fitness features available. There are some serious differences between these two wearables. From the health metrics they measure, to the connectivity within, Apple & Samsung couldn’t be more different in their approach to conquer the wearables market. Take a read below to discover the differences between Apple Watch Sport and Samsung Gear S.
Apple states that their timepiece is “designed for athletes who are committed to improving performance”, with one of the key features being GPS tracking when connected to your iPhone. In my eyes this has serious limitations. An elite athlete who is committed to improving performance, doesn’t want the burden of carrying around their phone AND watch on an arm just so they can measure their pace and distance covered. Samsung’s Gear S release has GPS connectivity built inside the watch, meaning you can leave the phone at home and crack on with your run without the need to clutch onto additional devices. Going a step beyond GPS, the Gear S can house a sim card within to give you a mobile experience without your phone. Leave your smartphone in the gym locker and crack on with your workout, it’s one less device you have to worry about. It’s super useful too, say if you’re exercising outdoors and you get involved in an accident as you’ll have the connectivity to message for help. Apple Watch needs to be within range of a compatible iPhone to receive iMessages and other relevant notifications. 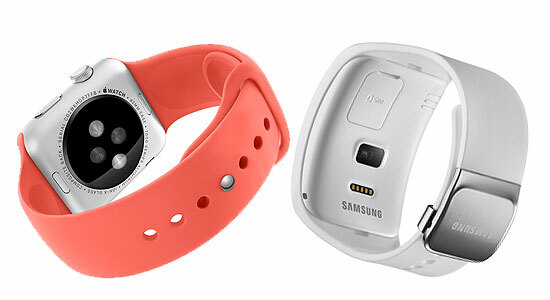 Worth a read : Exercise and Fitness features on the Samsung Gear S Watch. Both watches will only be compatible with smartphones made by that manufacturer. Even though the Gear S has mobile connectivity, it still needs access to a Gear Manager app from a Samsung smartphone to make major changes to the wearable. I’ve compiled a list of all the devices which are compatible with each watch. It’s quite disappointing that Apple’s Watch isn’t compatible with iPad, as Samsung’s tablets can connect to the Gear S. As a Nexus 4 and iPad Air user, this means my current devices won’t work with either wearable. If you do own one of the phones listed, happy days! Just make sure you’re software is updated to iOS 8 (Apple) or Android 4.3 (Samsung) to pair up your smartphone and wearable correctly. Both smart watches function on entirely different software. The importance in comparing here is the availability of fitness apps and updates. At least in the lifetime of these two smartwatches, its guaranteed that Apple will have a greater range of fitness apps built for its watch face over the newly established Tizen platform. As seen in iPhone and iPad, app developers have historically given iOS more support, even over Android Google Play apps. Tizen on the Gear S is a relatively new software face which with limited exposure may not receive all the great apps an Apple Watch might. That said, there are already 1000 custom apps already designed for the Tizen platform. These include fitness leaders such as Endomondo, MapMyRun, Runtastic and Komoot for mountain bikers. And if you’re worried you’ll use too many fitness apps on the Apple Watch, the launch of Health will be a useful feature to collate all your measurements and readings within a single view. 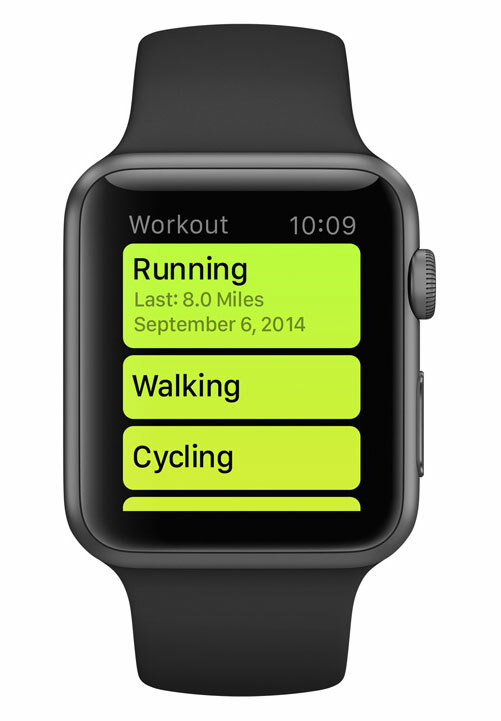 Speaking of apps, I’m pretty certain we’ll be seeing Nike presence on the Apple Watch Sport too. With the Gear S however, this intuitive Running app is pre-loaded onto the wearable from out of the box. It can measure the distance of your runs via GPS, and give you real time Facebook cheers of encouragement thanks to mobile connectivity. 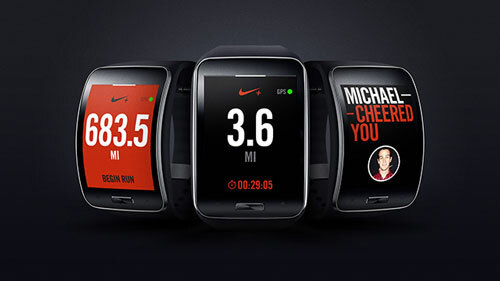 Though the Nike+ app on the Apple Watch will offer similar features, you’ll need your iPhone within reach at all times. The activity app across the range of Apple Watches breaks down your movements into three key phases which are visualised as three colourful rings. Combining data gathered from the heart rate sensor and accelerometer, the watch is able to calculate three key metrics for a healthier lifestyle. Monitoring when when you stand, the Apple Watch Sport wants you to stand for at least one minute per hour for 12 hours of the day. Whether walking or all out interval training, the aim here is to achieve a cumulative 30 minutes of movement during the day. This is a calorie target for the day. The more you move, the sooner you’ll fill the circle. Your targets are based on previous days, so with time you’ll get more challenging calorie goals to push you onto greater fitness levels. The key information is laid out in a visually appealing manner which is easy to understand. Ideal for those who want to shake off a sedentary lifestyle and gradually up their activity through small lifestyle changes. All historic data can be revisited via an iPhone. Both devices can monitor heart rate straight from the wrist. One interesting development on the Apple Watch side, is the ability to share your heart rate with another wearer. Could this be useful in the personal trainer industry, to see how intense your clients are working out? The way the watches charge differs greatly. For the Galaxy Gear S, a charging cradle is used to power up the 300 mAh battery within. The cradle attaches to a mircoUSB port which could then be connected to a mains plug or a desktop. Apple on the other hand have come up with a pretty effortless way of charging. Combing inductive charging with MagSafe technology, the circular pad magnetically fits over the underside of the watch face. My old Garmin FR405 stopped working once because I got caught out in the rain when I was miles from home. With no mention of water-resistance on the Apple Watch Sport announcement, I fear it may be limited in wet conditions. Starting at $349 it would be an expensive mistake to let it frazzle on your arm in a run during heavy showers. A true sports watch needs to remain functional on your wrist, whatever weather comes your way. And though California may get plenty of sunny days, here in the UK I need a watch which can survive the conditions of a cold and wet morning run . In contrast, the Gear S boasts an IP67 rating, to offer advanced water and dust resistance. There are no issues with wearing it in the shower, so I assume you can run in the rain with it too. Ultimately, the best smartwatch for you, will depend on whether you are keen to improve basic fitness or challenge sporting performance. Apple’s wearable will resonate greatly with an audience who are looking to improve their fitness and get active. And though I’m sure it will detract sales from sports wearable leaders such as Garmin and TomTom, I don’t believe the Apple Watch Sport offers tracking features to a precise enough standard for competitive athletes. The Gear S watch however delivers relevance and for endurance runners this could be a pretty useful device for tracking mileage and speed. What are your thoughts on the Apple Watch and Gear S for sports activity? Let me know on Twitter.